The ability of a piece of music, a smell or a taste to recall instant memories is something fascinating to me, and having the chance to revisit Path of Miracles this year has brought so many incredible experiences to mind. I have been privileged to have performed in every complete live performance of Joby Talbot’s masterpiece, Path of Miracles, and as we conclude our year-long tour of the work, I have been asked to put down a few words about my experiences over the last 13 years since its inception. I was with Nigel and his wife Grace on the morning of the 7th July 2005, and remember clearly watching the news together with growing concern as to what events might be transpiring; once that image of the iconic red London bus with its roof blown back appeared on the screen, we knew things had changed for everyone. 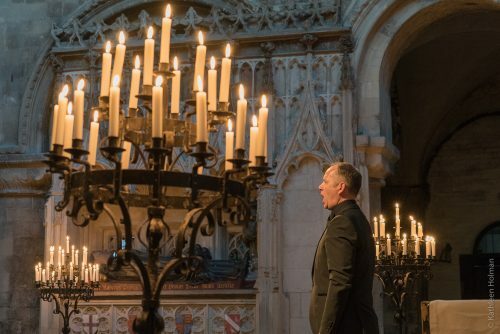 The performance that day would have been a culmination of about a month’s work for the choir, from the read-through with Joby, to memorising huge sections of the piece, working with the director in the amazing space of St. Bartholomew-the-Great to create something truly unique and for many of us, life changing. Although we subsequently recorded and premiered the work, the impact of the piece didn’t seem to warrant the work put in. But deep down, we all knew the piece would have its time. Over the next few years, we were lucky enough to tour the work throughout the world, with a particularly memorable trip in 2006 to Northern Spain, performing the work in both Burgos and Leon, and later on in Santiago itself – a real treat to put this music with its layers of folktales and myths taken from the pilgrim’s guidebook the Codex Calixtinus, into the very places of which we sing. It was on this tour that I witnessed the effect the piece has on not only the audience but the performers. After our performance in Santiago, a soprano colleague looked at me once the final chords had diminished and simply asked “What have I just experienced?” and for many in the audience this last year, this is a question often asked. The piece seems to have a power to lift an audience up and take them on the journey with us – through the uncomfortable and disturbing pasiputput to the trudging, unsettling 2nd movement Burgos – representing the period in the Camino where you enter the high area of Spain known as the meseta. This is traditionally the place in the walk where one turns “inwards” and begins to reflect on the reason for the journey – often not the reason one was expecting – the hypnotic writing Joby creates here is incredible. The third movement, Leon, changes the sound world entirely and mimics the incredible coloured light of Leon Cathedral’s stained glass as voices soar upwards. To have had the chance to put this music into that space was a memory I will hold dear forever. And finally euphoric Santiago capturing the moment at the Monte de Gozo where you at long last see Santiago shimmering in the distance. For all of the memories of the fun of touring the piece conjures in my mind, it has also brought people we have lost to the mind. It is impossible to sing the piece without seeing Barbara Pollock (the commissioner of the work) somewhere there in the audience, smiling proudly back at us. She was truly a lovely lady whose legacy of generosity of spirit lives on through this music. Reflecting on this past year in particular, my abiding memory will be of watching a new generation of fantastic young singers getting to know this piece, making it their own and discovering for themselves the power of the work as a performer. For me, there were several stand-out moments – St. Bartholomew-the-Great was simply an incredible experience. It is the first time in a while I have seen colleagues take themselves into a quiet corner in order to gather themselves before a performance; it really mattered to do oneself justice on such an occasion. Hearing the feedback from friends afterwards made me realise that we had done something very special. To see Gabriel Crouch’s wife Christie Starrett, a veteran of many Tenebrae performances, inconsolable with emotion, and a friend of mine who has attended some of the finest festivals all over the world describing the performance as “simply the best thing he’d ever heard” – reactions like this made me realise the piece had now found its time again. The performances in Melbourne were also truly special, and having our old colleague Chris Watson (now Director of Music at Trinity College, Melbourne) back in the ranks; feeling his emotion during the final stages of the piece and the effect it had on us all was one of those times when music transcends words. Whilst listening to the recording of this work is great in itself, it has become clear that the piece needs to be “experienced” live. The exchange of energy between performers and audience, especially as we promenade around the various spaces, is something unique in the choral repertoire. To have had the chance to perform it as much this year has been an incredible opportunity for me and I look forward to our tour to the USA next year. With each performance being unique, it is difficult to explain to people how it feels from the inside, but there is one moment in particular when I can begin to relax and listen and experience a little of what the audience hears. This journey has certainly changed me and I am grateful for every step of the way.